Pregnancy is a wonderful time to start yoga and specialist pregnancy yoga classes are great if you already have a yoga practice. 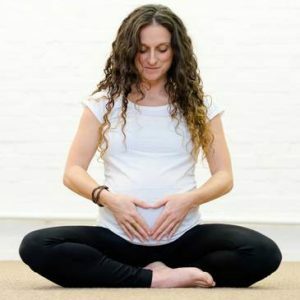 Pregnancy yoga can allow you to deepen you connection with your baby, make friends and enjoy your journey to motherhood. Pregnancy yoga is a beautiful feminine practice where we take time to relax, recharge, move in ways that feel good for you and your baby. You will also learn beautiful visualisations, mantras and breathing techniques to help ease anxiety as well as aid childbirth. The classes also touch on active birthing techniques, hyponobirthing and yoga postures to use during childbirth. Elements of pregnancy Pilates are woven into the classes to build stability around the pelvis and pelvic floor to aid childbirth as well as recovery post-natally. Yoga & Pilates through pregnancy can really help to prevent back, pelvis and other pregnancy related injuries. When, Where and What will I need to bring ? You will need to be in your second trimester of pregnancy to attend this course (12 weeks onwards) & have had your 12 week scan. Please contact Rosie if you have any questions, pregnancy yoga is such a fantastic practice I urge you to come along and give it a go.